The sun has finally made an appearance this summer, so let’s make the most of it. It is hard to eat when it is hot, but important that you do, so here are a few light meals that you could try as long as the weather holds. Chicken and tomatoes are things that most people will have in their fridge, this little summer dish is a great simple twist. 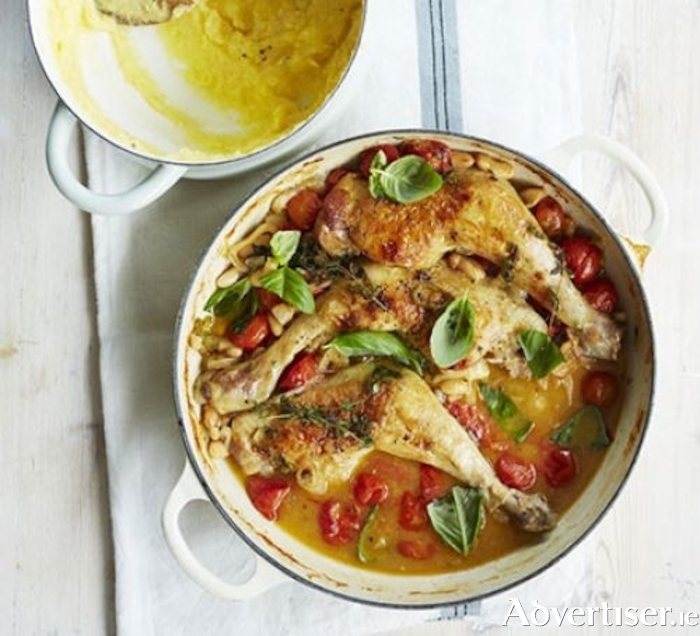 This is a lovely one pot dish that can be made in advance and served with rice, pasta, or just a crusty baguette. Heat the oven to 180C. Heat one tablespoon of the oil in a shallow flameproof casserole dish over a medium heat. Throw in the shallots and soften, then remove and set aside. Season the chicken, turn up the heat and add to the pan with the remaining oil, browning all over. Return the shallots to the dish, pour over the stock and add the garlic, thyme, tomatoes, beans, and chilli. Bring to the boil, cover and put in the oven for 30 minutes or until the chicken is cooked through. Remove the lid and cook for 10 minutes more to reduce the sauce. How easy was that? It will feeds four and has a Mediterranean theme. Sprinkle with fresh basil to serve. This is another great summer dish using some of the simple ingredients that you will probably have in your kitchen supplies. Brown the minced pork in a non-stick pan in the oil, for six or seven minutes. Toss with garlic, red chilli, and two tablespoons grated fresh ginger. Remove from heat and toss with two tablespoons lime juice and one tablespoon soy sauce (adding 1/4 cup water if dry ). Whisk two tablespoons lime juice, one tablespoon soy sauce, 1/2 tablespoon grated ginger, and brown sugar. Toss with the cucumber and scallions, and then add the coriander and mint. Serve with the pork over a bed of rice. Now for something sweet to mix things up — this is still a great summer dish. Preheat the oven to 175C. Spread the almonds out on a baking sheet and bake until light golden, six to eight minutes. Set aside to cool. Bring a medium saucepan of water to a boil. Cut an X in the bottoms of the peaches and tomatoes. Carefully add the peaches to the water and boil until the skins just start to peel back, about one minute. Remove with a slotted spoon. Repeat with the tomatoes, boiling for about 15 seconds. Set aside. Add the basil to the boiling water and cook until just wilted and bright green, about 15 seconds. Transfer with a slotted spoon to a blender and puree until smooth. With the machine running, add the olive oil and 1/4 teaspoon each salt and pepper. Peel and pit the peaches; peel the tomatoes. Cut both into 1/2-inch slices. Spread the basil puree on a serving platter. Arrange the peaches and tomatoes on top. Sprinkle with the lemon juice and dollop the ricotta on top. Sprinkle with 1/4 teaspoon salt and 1/8 teaspoon pepper. Top with the toasted almonds, garnish with whole basil leaves and serve. It is important to stay hydrated in the heat, especially if you are working, so how about a lovely iced tea? This is the perfect drink on a hot summer’s day, easy to make, full of antioxidants, it is like sunshine in a glass. Boil a kettle of water and pour over the teabags, let it brew for 10 minutes, and then remove the teabags. Add the lemon juice and then adjust sugar to taste and let it cool. Grab four tall glasses and fill them to a third of the way with ice cubes. Slide the lemon slices onto the sides of the glasses, bruise a few mint leaves with your fingers and add to the glasses. Top with the brewed and cooled tea, garnish with remaining mint leaves and a slice of lemon. Stir with a spoon to mix the flavours through. Enjoy the sun, when we have it, our summers are never long enough. Talk to you next week.